Our products are safe to use and require very low costs. Pb : 9 to 11%. Sn : 9 to 11 %. Lining Hardness : HB 67 to 167 . 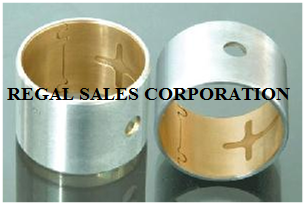 We are manufacture of Bi metal washers in copper + aluminum. These are plain washers but with two different metals on wither side. 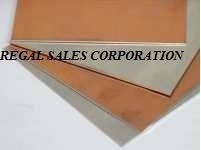 We can also manufacture the same according to the composition of copper and aluminum that you require. These can be manufactured in mm & Inches as per customer requirements, specifications & drawing. Bimetal Strips prevents galvanic corrosion & electric loss. Cuts cost and saves equipment from damage. High cost of copper has prompted manufacturers to use bimetal (Copper and Aluminum) conductors to carry current at all voltages (i.e. EHV, HV and LV). All metals are exposed to corrosion. When two dissimilar metals are held close together, presence of moisture, salinity and pollutants cause galvanic corrosion and electrical loss due to electro-chemical action. moreover, a bad joint can cause electrical resistance, rapid aging of insulation leading to short circuits and endangering life, property and loss of production damaging the equipment itself. Bimetal Connectors are manufactured to reduce joint resistance and prevent galvanic corrosion. It ensures long life for terminations and improves reliability of power systems of all voltages. The bond is perfectly metallurgical and is subjected to various tests such as Bend, Cup, Chisel, Electrical Specific Resistance etc. The best properties of different metals and alloys are combined economically to solve the design problems. This connectors are inserted between the two dissimilar sections of the terminals. The aluminium sheet facing the aluminium section of the joint. BIMETAL STRIPS are available in thickness of 1mm, 1.5mm, 2mm and 2.5mm with copper to aluminium ratio of 20% - 30% and 70% - 80%. Special connectors to suit various sizes are also manufactured. Copper/Aluminium Bimetallic Ferrules are also available in standard sizes at competitive rates. Our enterprise engaged in manufacturing and trading of a broad spectrum of Bimetallic Sheet. A bimetallic sheet is made of two or more metals and widely used in designing wide range of light weight to heavy weight machines. Our range has gained worldwide appreciation owing to the features like sturdy construction, light weight, easy foldable and anti abrasive finish. We develop our comprehensive array strictly on the line of the industry specific quality norms. Looking for “Bi Metal Products”?